HOME BUILDER’S ASSOCIATION OF METRO DENVER – The Home Builders Association of Metro Denver (HBA) Installation and Recognition Reception held an exciting celebration in early December that drew more than 150 prominent builders, developers and associate members in the industry. Along with the newly elected president and Board of Directors that were installed during the event, the engagement honored the 2015 Home Builder, Associate Member, and Volunteer of the year. 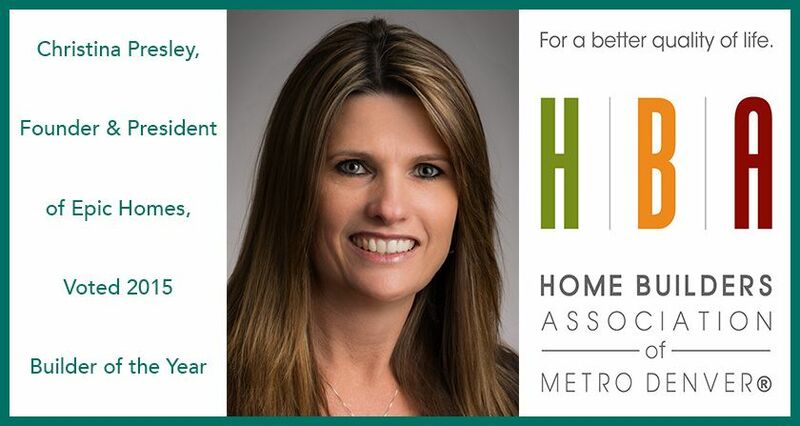 Chris Presley, president and founder of Epic Homes and the first woman president in the HBA’s history, received the award for the 2015 Home Builder of the Year. Jim Fitzmorris, vice president of JR Engineering accepted the award for the 2015 Associate Member of the Year and Jeff Kappes, vice president of Shea Homes was honored as the Volunteer of the Year. Each award specifically recognizes individuals who demonstrate leadership, professionalism and personal commitment in the association, and represent the “Best and the Brightest” in the industry. Also honored was Chérie Talbert with the first-ever Advocacy Award for her tireless advocacy efforts. “This award is truly an honor and I’m so grateful for those individuals who nominated me as the Home Builder of the Year. There are many exceptional individuals who work for builders in the Denver marketplace; I am thrilled to be recognized among my colleagues in the industry,” said Chris Presley.